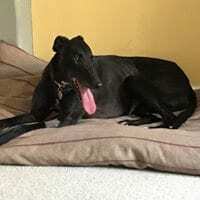 Emily is living in a foster home with other female greyhounds and she is just lovely – if you are looking for a dog that will just fit in with your lifestyle, then Emily is perfect. She has spent 7 years living in a kennel with no creature comforts but she found the sofa – and was on it roaching – within 24 hours of moving into her foster home. We were all very impressed. Emily is little Emmas mum – she is a very sweet 7 year old girl who just wants a nice home so she can strat to enjoy her life. She raced in the UK but when then sent back to Ireland to breed – now she is of no use to them, she is lucky enough to be coming into rescue. If you have children please read our section on children and hounds. Emily has a pet passport.